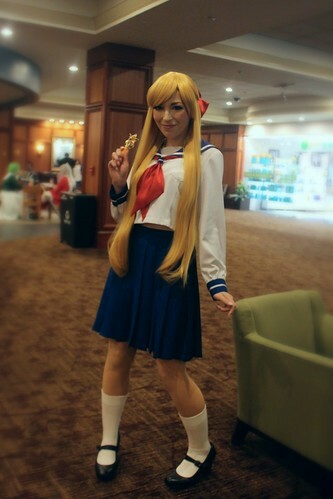 This past Saturday, I attended Anime Boston. If I have done my calculations correctly this year is my seventh year in a row attending and my ninth overall Anime Boston. It ended up being kind of an odd year this year, not necessarily a bad year but we got a late start due to us deciding to watch an episode of the old Sailor Moon series on blu-ray while we were getting our con stuff ready…. eight episodes later, it was suddenly almost four in the morning and we were wondering where the time had gone. Parking was an issue and my camera lens even decided to get it on the action and decided to have issues as well, I eventually managed to fix it but I didn’t get as many pictures as I would have liked this year. Even with the odds seemingly stacked against it it still worked out to be a pretty good year all in all just a little different than what we expected! Cosplayers – If you would a copy of your photo emailed to you or if you would like your photo removed, please comment here or drop me an email at pullipsandjunk (at) gmail.com . I would appreciate a link back here or to my flickr if you would like to use my photos elsewhere. 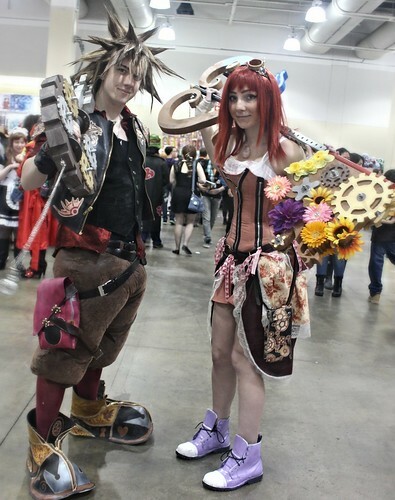 I love Kingdom Hearts so I was very excited to see these great Sora and Kairi cosplayers in the dealer’s room. I believe these two are supposed to be like cyberpunk versions of Mortal Kombat characters Sub-zero and Scorpion, whatever they are from they look pretty damn awesome! 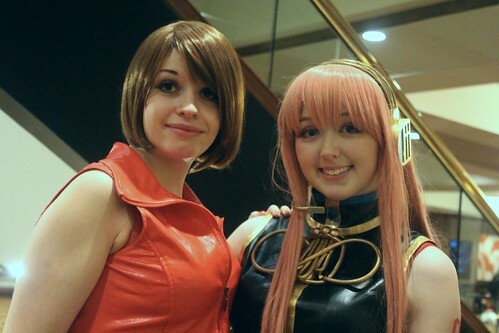 Very cute Luka and Meiko from Vocaloid! I was surprised not to see as many Vocaloid cosplayers this year, normally it seems like I see at least a couple of dozens Miku running around every year. 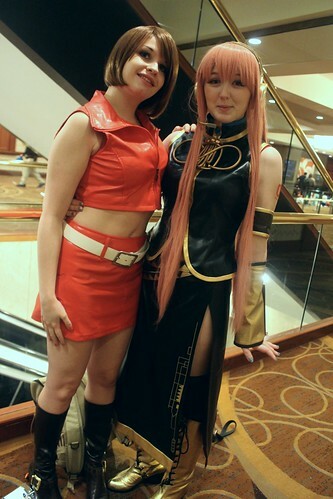 Close up of Meiko & Luka. My bestest minion (yes that is what I call one of my friends) is obsessed with Deadpool so I could not resist taking a picture from him when I saw this line up. Before I turned a corner, I heard someone strumming away on a guitar much to my surprise it was Yui from K-on! 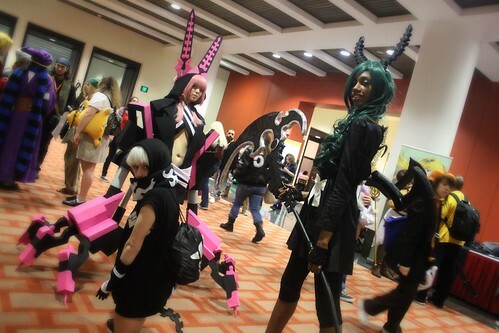 Some really great Black Rock Shooter cosplayers, their props were really amazing! I found two different versions of Saber hanging out together, both of their costumes were great but not sure which version of the outfit I prefer. This was the first picture I took this weekend, I did not expect to see a Joker & Harley Quinn in black and white this weekend. The wind outside was definitely not the best for photos! Joker & Harley Quinn are my favorite comic book characters so I always have a weak spot for them. 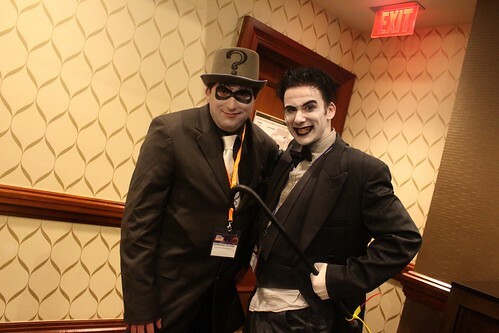 I bumped into the same Joker later on hanging out with a Black & White Riddler as well. Of course I could not resist taking the iconic killing joke photo with my phone. This guy was definitely one of the best Joker cosplayers I have seen. I always try to attend the bjd meet when I go to Anime Boston as I rarely get the opportunity to attend bjd meets or really get the chance to talk bjds. 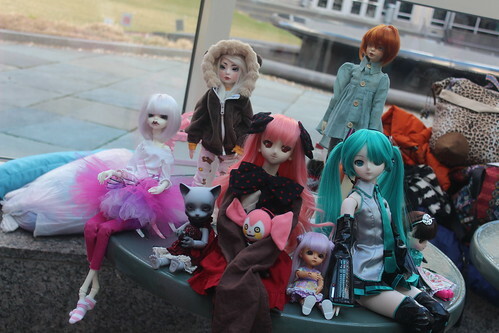 I brought along my Pipos Black Smile Cheshire, my custom Sakuya Izayao DD (cosplaying as Bebe/Charlotte), a Lati and my Vocaloid Miku DD. Mr. Klein was very determined to take Miku with us unfortunately I completely forgot that I left my Volks carrying bag at the storage unit last time so he decided to haul her box with him all day rather than taking the much saner course of action of leaving her at home or using a normal bag like I did for the other DD. 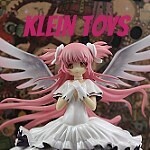 So if you saw someone hauling around a Vocaloid Miku DD box this weekend it was most probably Mr. Klein. There was even another DD there! Other In addition to the doll meet, we attended two panels and hit up the artist’s alley in addition to the dealer’s room. There has been a really awesome Sailor Moon panel we have attended the last few years, there was a Sailor Moon panel on Saturday so I incorrectly assumed that it was the same trio putting this one on, I guess their panel was Friday this year ^^;. The panel we went to was pretty interesting it just wasn’t the one I was expecting. We attended Bad Anime Bad for the third year in a row because apparently we are gluttons for punishment, this panel always gives me such great Christmas/birthday gift ideas for my friends… to those of you who think I am joking, quite a few of my friends received Garzey’s Wing on dvd for Christmas this past year. 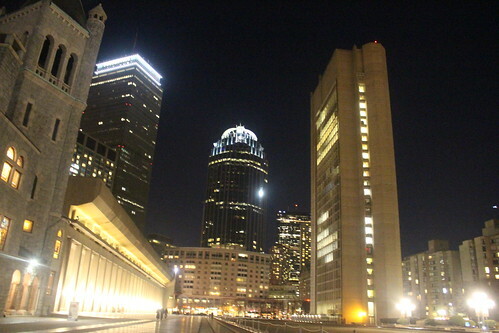 So long Boston! I loved this view as we were walking back to the car. 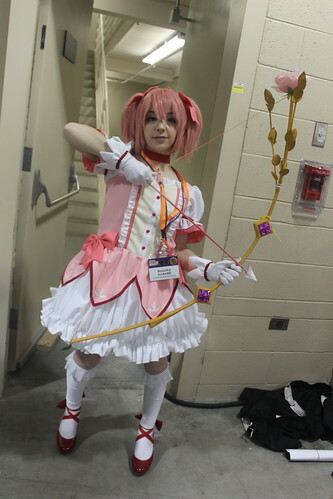 More photos from Anime Boston are on my flickr for interested parties! So what did I buy? Honestly not that much, I was a bit underwhelmed by the dealer’s room this year. It seems like I saw more Funko Pops than anything else this year, don’t get me wrong I love Funko Pops but I can buy them from Amazon anytime. 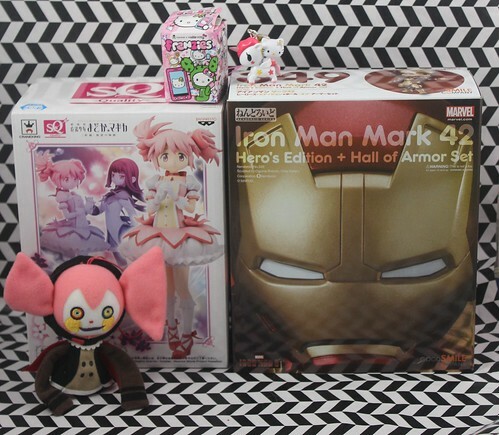 I bought a Hello Kitty x Tokidoki Frenzie to put on the Tokidoki x Hello Kitty purse I recently got for my birthday, a small Bebe plush from Puella Magi Madoka Magica as well as a Banpresto Madoka figure. My favorite item that I purchased was the Iron Man nendoroid which I have been wanting for quite a while, so that was a nice and unexpected find at least. On the bright side, I barely touched my Anime Boston budget so I plan on treating myself to an Iron Man Hot Toys some time in the next few days. I have been wanting one for quite some time but always seem to get distracted by dolls when I have money in hand. At least I will finally have someone to keep Loki company. 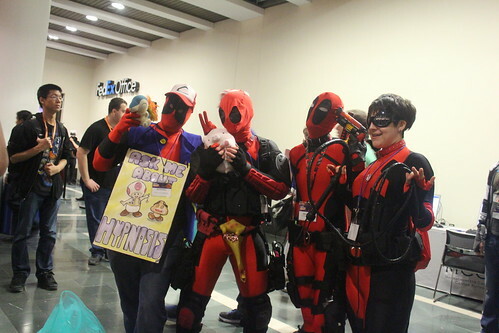 This entry was posted in event and tagged anime boston, anime boston 2015, anime convention, BJD, black rock shooter, cosplay, cosplayer, deadpool, harley quinn, iron man, joker, K-on, kairi, kingdom hearts, luka, meiko, miku, nendoroid, Puella Magi Madoka Magica, sora, vocaloid, Yui. Bookmark the permalink.